As summer draws near and you get ready to head to OCNJ for your beach vacation, you are probably getting your beach bag ready. Here are 8 essential items that you don’t want to forget to pack for your time at the beach! A high spf sunscreen and spf lip balm–protect yourself from the sun and don’t forget the lip balm! A waterproof and sand-proof bluetooth speaker–if you like to listen to good music on the beach–this is a must! Oversized beach towels–regular size towels just don’t do the job, spring for the oversized ones to keep you dry all day! A pack of towel clips (or good old fashioned clothespins will do the job too)–you won’t need to keep adjusting your towel all day long, clips will keep it in place. A portable phone charger–the sun has a tendency to drain your battery. Keep your phone out of the sun so it doesn’t overheat, and a portable charger will keep you charged all day long. A large refillable water bottle–don’t forget to stay hydrated! Have you booked your OCNJ rental yet? Call us today! 1 – Summer is coming! Many buyers looking in OCNJ are looking to take advantage of the summer months. They want to have everything taken care of in their new home so they can relax come summer. Other buyers are also looking now for investments in rental properties. The sooner they have their home, the sooner they can start booking rentals. 2 – Since OCNJ is a vacation spot, most buyers aren’t basing their move around the school year. That means many buyers have flexibility in buying and closing. 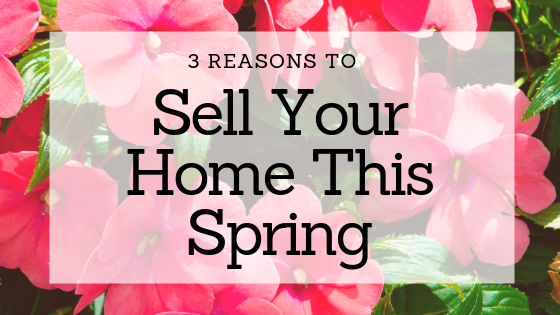 3 – Spring Market is here! Serious buyers are attached to their computers waiting for new listings to pop up. Whenever you choose to list your home, know that we are here to help! A Marr Agency agent can be reached at 609.399.7036. The Music Pier. Located on the Boardwalk, the Music Pier holds fun events, concerts and shows all summer long. It is a great place to bring the whole family because events are often family friendly or you can spend a special date night catching a great concert. Tickets prices are affordable and sometimes free. The Summer Concert Series always brings in entertaining performers. You can check out the schedule here. Variety of Accommodations. If you a visiting for a week or longer, there are a number of great vacation rental homes available. Book yours now before it is too late! If you are attending for just a short visit, there are hotels, motels and bed and breakfasts located all along the island. If you like the outdoors, there are also campgrounds! There is always somewhere to stay in OCNJ. The Beach. Eight miles of white sand beaches, you will always find a place to relax, listen to the ocean and enjoy the sites and sounds of the beach. Take the whole family and enjoy the sand, the sun and the waves. Boardwalk. With two and a half miles of boardwalk, you and your family will find lots of fun things to do. You can grab a slice of pizza, play some mini-golf or visit one of the many shops. Amusement Rides. While strolling along the boardwalk with your family, you won’t want to miss out on Gillian’s Wonderland Pier or Playland’s Castaway Cove. There is something for kids of all ages. Make sure you take a ride on the Ferris Wheel which provides spectacular views. Yianni’s Cafe located at 841 Asbury Avenue, will be having its annual Breakfast with the Bunny on Saturday April 20th. From 8:00-12:00, you and your family can enjoy a great breakfast with the Easter Bunny! If breakfast with the Easter Bunny wasn’t enough, hop on over to Spoon Sip located at 838 Asbury Avenue from 2:00-4:00, on Saturday April 20th for some frozen yogurt and fun! A traditional non-denominational service by the sea. All are welcome. Sunday, April 21st at 6:30am, Music Pier, Moorlyn Terrace and Boardwalk. On Sunday, April 21st in front of the music pier from 12:00 until 1:00 pm. The Philly Keys will be performing their hit dueling pianos show starting at Noon. Free fun for the entire family! Come dressed in your Easter’s best to stroll in our Fashion Promenade and meet the Easter Bunny. In front of the Music Pier, Moorlyn Terrace & Boardwalk from 1:00-2:00 pm. Judging begins at 1:00pm. Prizes awarded for Best Dressed Children, Teen, Adults and Family. Don’t miss Easter weekend in OCNJ, it’s always a great time with lots of fun activities for the entire family! Have you ever been walking along the boardwalk with your family and realized you forgot your wallet? No need to worry, as long as you have your phone, OCNJ is going cashless. The Ocean City Regional Chamber of Commerce is planning to upgrade its vacation app so that people can make cashless purchases with their cellphones. The app will also alert users to sales, special events and include a loyalty program. Looking for fun Easter activities for the kids? Come to Ocean City, NJ for The Great Egg Hunt. A giant egg hunt on the beach between 11th and 14th streets, the egg hunt is for children 7 years of age and younger. 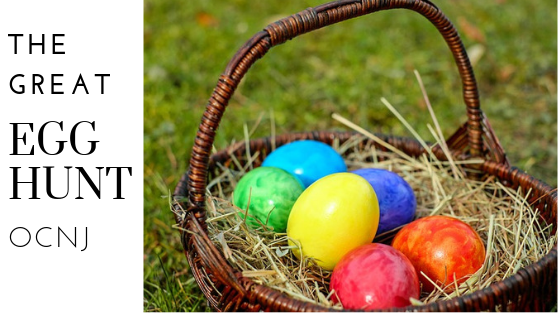 Children will search for over 100,000 eggs scattered on the beach and stuffed with candy and surprises from local merchants. The event is set for Saturday, April 13th starting at 2:30 pm. Where: 11th- 14th St. Beach. Rain date: April 14th. For more information call 1-800-BEACH-NJ. 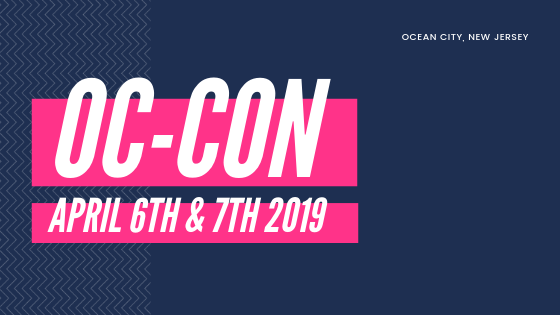 If you are a fan of comic books, you will not want to miss OC-Con on the weekend of April 6th and 7th on the Ocean City Music Pier. Special guests include Levar Burton from Star Trek: The Next Generation and Reading Rainbow acclaim. Get in on the opportunity to get an autograph or selfie or sit in on a Q&A session. The weekend long event also features meet the artist sessions, discussions, cosplay and displays and sales by multiple comic book and memorabilia vendors. Additionally, there is a one mile Superhero run! For more information or to purchase tickets for the event. Click here. Yeti Hopper Flip Portable Cooler–perfect for those heading alone to the beach to soak up some sun for a few hours. While it is pricey, this cooler will keep 6 of your favorite drinks ice cold for days. Igloo Cool Fusion 36 Can Roller— if you need a cooler that will accommodate the entire family, this is the one for you. With sturdy wheels, making it easy to roll over the sand, this cooler locks in the cold, and is made from both hard and soft material. Igloo Ice Cube Cooler–This cooler is portable, has a 14 can capacity and is budget friendly. Clevermade 50 Can Soft-Sided Collapsible Cooler–if you are looking for a cooler that won’t take up too much room in the car, this collapsible cooler is a must. The leak-proof insulated interior will keep food and drinks cold all day. It is also large enough to hold drinks and food for the whole family or a large group of friends. Coleman Coastal Xtreme Series Marine Portable Cooler, 120 Quart–This cooler is rugged and can take a lot of wear and tear. It can keep things cold for days on end and it is budget-friendly. Now that you got your beach gear you just need the beach house. Call us to reserve your dream house 1-609-399-7036. If you are trying to decide exactly where you are going to take your summer vacation, look no further than OCNJ. Aside from all the wonderful amenities that OCNJ has to offer, the beach is actually beneficial to your health. It is true, numerous studies have proven it! The rhythmic sound of waves crashing, actually starts to put your mind in a meditative state (that’s why sleep machines always include the ocean waves). The sound of the water naturally puts you in a calm and relaxed state. When you are sitting on one of the 8 miles of OCNJ beaches, staring at the blue sky, not only does it make you feel at peace, but the color blue is causing a physiological reaction that reduces stress. When you soak up the sun’s rays (with ample sunscreen of course), there are a number of health benefits. The Vitamin D you get from the sun is good for your bones and studies have stated that is can help lower your blood pressure. Now is the best time to book your OCNJ vacation! Call us today to let us help you find the perfect rental! As February draws to a close, now is the best time to choose your OCNJ vacation rental. Did you know that January through March is the busiest time of year for booking summer vacation rentals? Act now, to get the perfect vacation home! Here are three reasons to plan your summer vacation now. You can check out your rental in person. On a nice sunny winter weekend, you can take a drive to the OCNJ and check out your potential rentals. Take a look at how close you are to the beach or the other important amenities that you want for your vacation home. Keep within your budget. If you book now, you can easily spread your payments out so it doesn’t bust your budget. The earlier you book, the easier it is to keep within your budget and get the perfect vacation rental. Location, location, location. 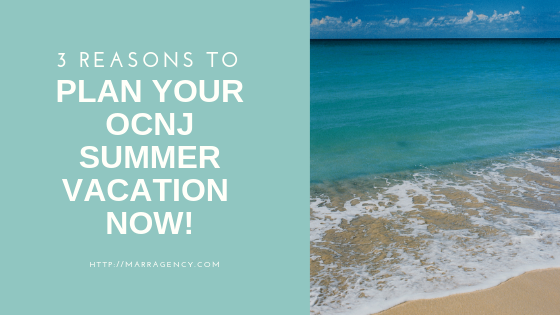 If you want to find the best location for your OCNJ rental…don’t wait. Since this time of the year is the most popular booking time, you might not get the location you want, so make sure you book now!